Do This With Your Patients, Over And Over Again. You all know what I am about to write about. Yes, customer service and the patient experience. Making your patients feel special and acknowledged is what you need to do over and over again. This is what keeps your patients coming back to you. Offering your patients the very best customer service is what makes the difference in your business. The real difference is when customer service is consistently offered to your patients at every appointment, not just once or twice when you first meet them as a New Patient. This is where many Dental Offices fail. Be careful you are not focusing all your Customer Service on that New Patient Experience and forgetting about your long term patients. The loyalty of your patients is nurtured slowly over time as you build a lasting relationship with them and offer the very best in Customer Service, but this loyalty can end very quickly if you start to take your patients for granted. I have seen Dental Practices do this and not even know why they are losing patients. So what is the great Customer Service you can offer your patients at each and every appointment? Great Customer Service is all about the small things you do and say to your patients. Great Customer Service is about “above and beyond” and it is about going out of your way to make your patients feel special all the time. The next time your patient is on the phone, even if you are super busy in your office, stop and spend that extra time and listen to them. 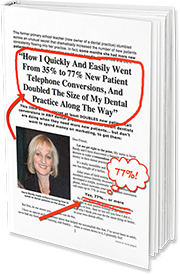 Always offer a solution to your patients on the phone and in the dental chair. Be your patient’s problem solver. When your patient arrives at your practice jump up and greet them before they say anything to you. As you talk to your patients remember they have an important life outside of your dental office. Be on their journey. All your patients have a birthday or events they are celebrating. Be part of that celebration with them. Offer the offer with your patients. Why not offer to also get something for your patient as you head off to lunch and they are waiting for their appointment. Offer to call your patient a taxi to take them home. Keep in touch with your patients, especially if you are not going to see them for 6 months. Send a message to say hello. Can you see that Customer Service is really the small stuff you do for your patients that makes your patients feel great at every appointment and creates fabulous patient loyalty. So do this with your patients over and over again!